I regard W F Harvey as a somewhat unjustly neglected author of supernatural tales. For a long time this writer’s work has been found only in rare and second-hand bookshops at exorbitant prices and it is only recently that his distinguished writings have become more widely available. A ghost story writer in what one may call a purely amateur capacity, Harvey penned several minor masterpieces of the uncanny, which refreshingly avoided the cliché while at the same time creating a wonderfully eerie sense of fear. Although he was by all accounts a fine, gentle and lovable man, he found pleasure and success in creating a series of dark, disturbing and frightening tales. Yet, paradoxically, Harvey’s work is remarkable for its subtlety and restraint. Like M R James he relies on the reader to pick up suggestions from the text to create his or her own horrid imaginings. However, unlike James, Harvey’s prose is straightforward and quite modern, lacking that pseudo-gothic, academic tone of James and many other ghost story writers of the time. During his lifetime Harvey penned four collections of short stories, the most famous of which was 1928’s The Beast with Five Fingers. The title story of this collection is one of the most anthologized, not to mention downright scary, ghost stories in the genre. William Fryer Harvey was born in Yorkshire in 1885 and educated at Balliol College, Oxford. He took his medical degree at Leeds but, never a robust soul, his training was interrupted by ill health. To help him recover fully, he took a voyage around the world, in the course of which he spent some time in Australia and New Zealand. The range of interesting and idiosyncratic individuals he encountered on this trip fuelled his imagination and contributed to his writing. On the outbreak of the First World War, Harvey enlisted into the medical service and became a surgeon-lieutenant in the Royal Navy. His military career was marked by incredible bravery – he was awarded the Albert Medal ‘for gallantry at sea’ following a life-saving operation carried out in circumstances of extreme risk to life and limb. Such was his quiet and unassuming nature, however, that it was only when this award was announced by the authorities that his family and friends learned of his heroic deed. Unfortunately Harvey was to pay a terrible price for his valour for, in the course of the operation, escaping oil fumes poisoned his lungs and he never really recovered. Despite his heroic, almost saintly character, W F Harvey had no problem plumbing the depths of the disturbing to produce tales of a chilling and often horrific and violent nature. The Beast with Five Fingers (click to read! ), for example, is typical of Harvey’s smooth and deceptive style, incorporating as it does sly moments of gentle humour amongst the dark and sinister shadows. One of the most effective touches with this particular narrative is the way the author allows the reader to be one jump ahead of the protagonist. While for some time young Eustace seems not to be fully aware of the terrible threat that has been unleashed upon him, Harvey enables the reader to be completely cognizant of the danger he is in. When the horror of his situation finally dawns on Eustace, Harvey subtly matches his panic with suspense and dread. 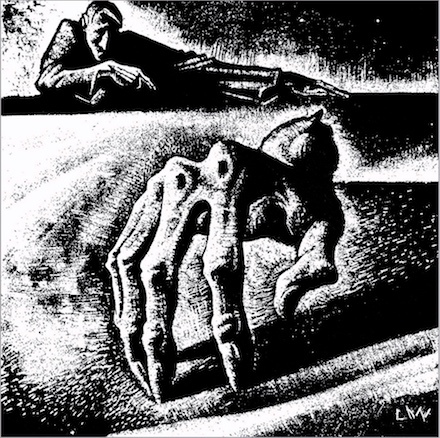 Given that The Beast with Five Fingers is so beautifully conceived and cinematic in its moments of climax, it is no surprise that the cinema has used the concept of the spider-like crawling hand in several movies, most notably Warner’s 1945 feature of the same name. Another version of the story is found in the horror compendium film, Dr Terror’s House of Horrors (1964). The hideous blackened hand scrabbling its way out of the fire grate is lifted straight from Harvey’s tale. Unlike many writers of ghost stories, Harvey’s subject matter and creative approach to the genre is very varied. He travels many different narrative roads in order to bring the tingle or the chill. The Habeus Corpus Club features a fantastic establishment patronized by the murdered victims of fiction – those characters whose literary lives have been cut short, usually in the opening chapters of a crime novel, and so have to leave the printed page in a premature, sudden and violent fashion. In The Tool the curate narrator discovers to his horror that on a week’s walking tour he has somehow mislaid a day – a day when he carried out a most heinous act of which he now has no memory. In this and other tales, Harvey subtly suggests that the strangest things could easily happen to anyone, even the reader. One story which is bound to strike a chord with many readers is The Dabblers, a story of school life which blends the innocence and naïveté of childhood with the youthful unfettered cruelties that accompany them. After the war, in 1920, W F Harvey became Warden at Fircroft, but his debilitated condition forced him to resign in 1925. He and his wife lived in Switzerland for a time – the clean mountain air there aiding his breathing – but, missing England, he returned home and died in Letchworth in 1937, at the young age of fifty-two. His legacy was a wonderful range of chilling tales which prove, as I said at the start of this post, that not only has this clever author been unjustly neglected, but also that he is one of the masters of the genre. ← Where is the Mona Lisa? Another excellent post! You are filling my library with all the ghost stories I have read and lost, and reminding me of the extraordinary potential of the ghost story. This may be too much to ask but I read a ghost story called Smee. Short for It’s Me. A country house party game gone wrong. I read it when when I was 12 and it gave me serious shivers. could you track it down? I bought your Ghosts/Cloisters on Kindle but as usually happens here the kindle’s battery is dead and we can’t find the bloody wire to recharge it! Yes, good choice, that’s also one of my favourite stories! It’s by A M Burrage, another master of the genre – I’ve added it to the ‘Ghost Stories’ page on this site. You might also like one of his other tales, ‘The Waxwork’ – if you can track it down of course! A question, since I have not read Harvey’s story about the H. C. club: Is the spelling mistake in the title intentional? A general comment: Your articles are a great pleasure to read, I enjoy the clear beauty of your language.